I hope the various photographers I gleaned the photos from will forgive me for using them. You can see more of the great photos they all take, along with some of the great articles they write, by following the links in the description of each photo. 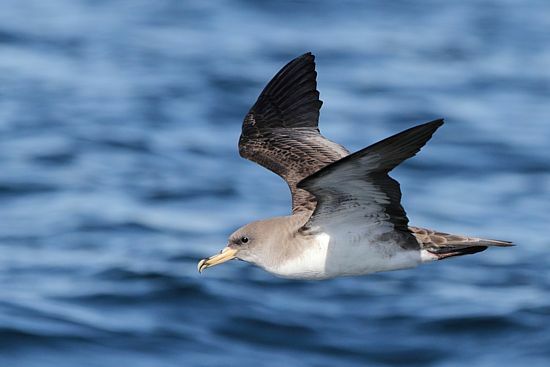 I’m sure many of you may know this already, but I for one have been largely ignorant about one of the relatively newly split species, Scopoli’s Shearwater (Calonectris diomedea), within the southern Africa subregion. 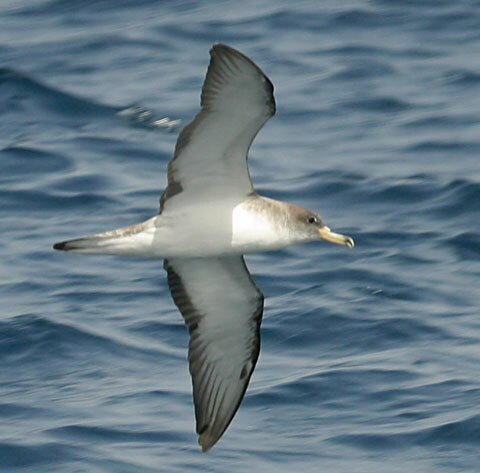 This species is closely related to Cory’s Shearwater (Calonectris borealis), with which it was considered conspecific for many years, and which many of us have seen on summer pelagic trips off either Cape Town or Durban. It has only recently gained full species status (within the last 5 years) after previously being considered a subspecies of Cory’s. The IOC (see worldbirdnames.org), and indeed BirdLife South Africa (see the checklist of South African birds here), recognize this as a separate species, so it is definitely a ‘tickable’ species, and with it being seemingly regular in our waters during the austral summer, it should be a species many of us have probably seen (and should see) on summer pelagics. The only downside with having gained this seemingly ‘armchair tick’ is that it is rather tricky to separate from Cory’s, and I’ll look at the main features for separating them below. After reading multiple papers, books, and articles and going through many photos, most individuals belonging to either Cory’s/Scopoli’s can be ‘comfortably’ separated, but only provided a good and close-up look is had, and preferably photos taken – for review later. While photos are not essential, of course, our brains can misconstrue small details, and we may actually think we see something that is not truly there, and essentially believe the ‘lies our brains are feeding us’. Of course, there is more to it than this as well – lighting conditions can vary plumage, and then there is individual variation in the species as well. Firstly, and what is the key means of separating Scopoli’s from Cory’s, is by observing the underwing feathers and pattern. Looking at it simply, Cory’s has a broader dark tip to the underwing, while Scopoli’s has a smaller dark tip, with more white on the primaries. Going into a bit more detail, the primary feathers (p6 – p9) on Cory’s are solidly dark or have variable (but always small) amounts of white on the primaries (from the primary coverts to the wingtip), but no white is visible on p10 at all (from the primary coverts to the wingtip), while Scopoli’s, however, shows distinct and long white tongues/inner webs on the primaries, including p10, eventually leading into dark wingtips and giving the impression of a much whiter underwing. 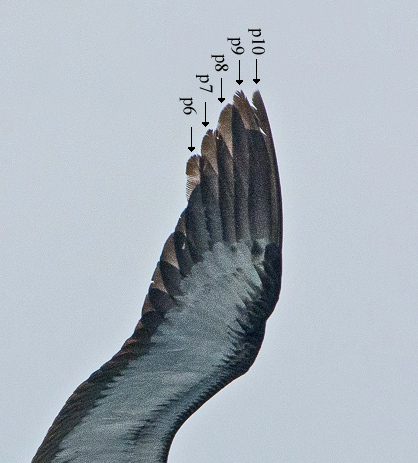 Here is an image showing the underwing primaries, and which feathers to concentrate and focus on. Secondly, and by no means a key feature (rather a backup feature acting in favour of Scopoli’s) is that of the structure of the bird. 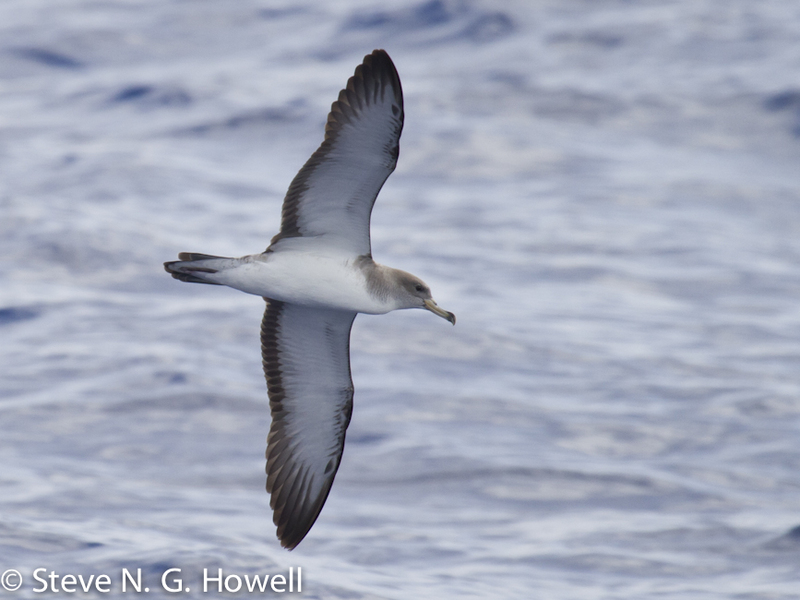 Scopoli’s is a smaller bird, weighing less than Cory’s, with slimmer wings, head and bill. This is an unreliable feature when used on its own, as there is marked sexual dimorphism in both Scopoli’s and Cory’s. For example, a male Scopoli’s may have similar proportions to a small female Cory’s, which can be very misleading. But this feature serves as a good backup feature for the first point above. Lastly, we have that of differences in flight patterns. 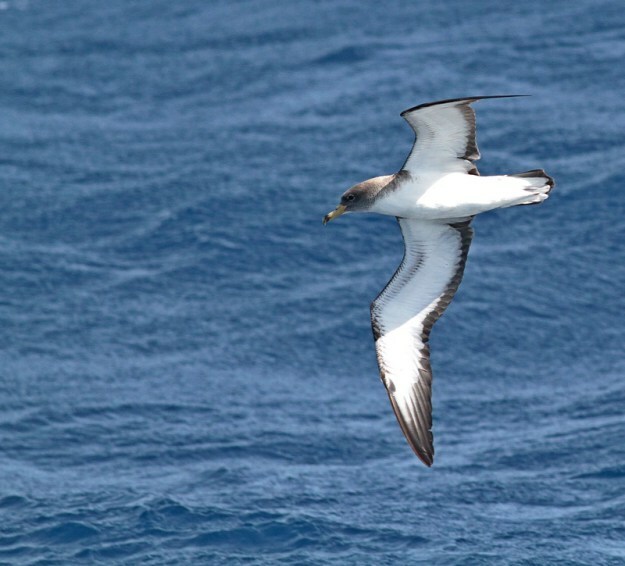 With Scopoli’s being a smaller bird, weighing less than Cory’s and having slimmer wings, the flight pattern of Scopoli’s is quicker on average, and the bird appears quite light in the air. Cory’s, however, is more bulky than Scopoli’s and shows a rather heavy, somewhat labored flight. This is also not a key feature, as weather conditions certainly can affect the manner in which the bird flies, as can the activity of the bird at the time. 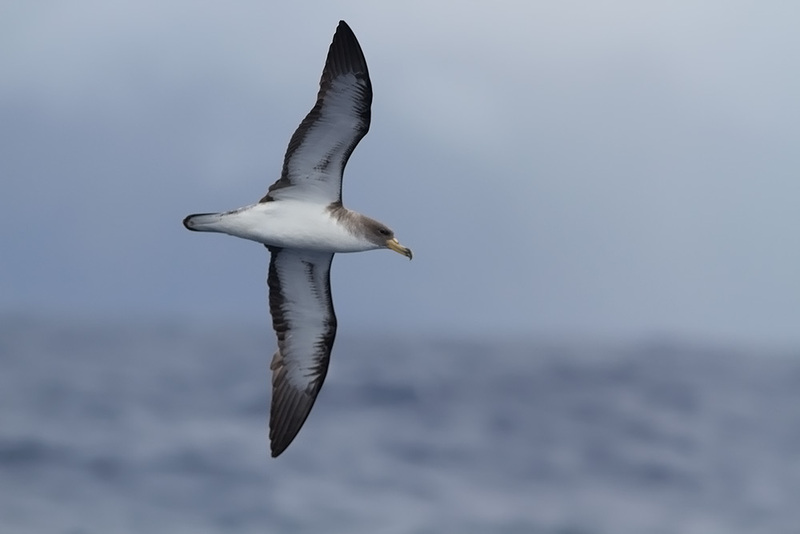 This feature mainly applies to birds in ‘natural flight’ (such as birds returning to colonies in the evening) as opposed to birds feeding and following fishing boats (such as stern trawlers and long liners), as we regularly see them. Scopoli’s does also seem to show more flaps (5-7) between glides, while Cory’s usually has very few flaps (2-3) between glides. This, again, applies to birds seen flying ‘naturally’ (not foraging), and while some Scopoli’s do show much shorter flap-sequences (such as around 3), observations watching these particular birds for a while will invariably reveal flap sequences between 5-7, as is typical of Scopoli’s, and very atypical for Cory’s. 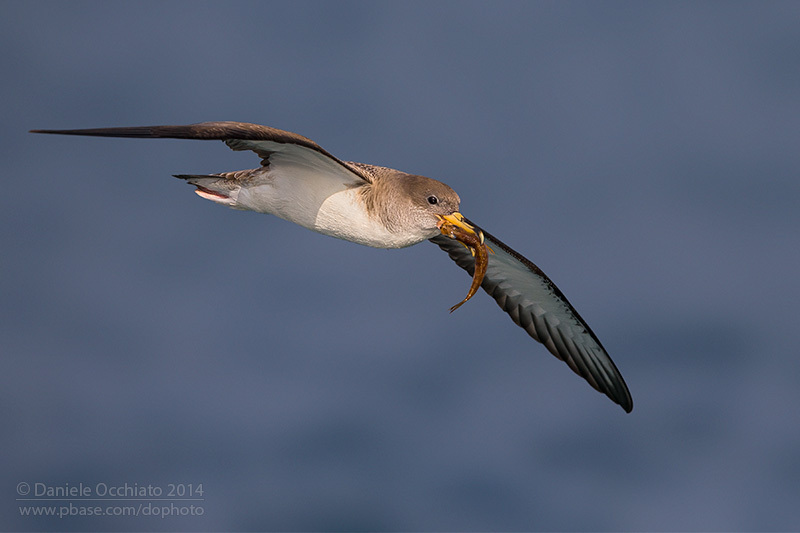 Again, this is not a key feature for separating them, and, combined with the fact that the majority of the time in our waters (on our pelagics) we find these birds feeding, it is probably less applicable to birds we encounter – but it certainly will help in favor of/against Scopoli’s if birds are noted. It has also been suggested that the upperwing pattern is of use, but many sources seem to disagree with this, as lighting influences this too much, as does birds in moult of any kind along with individual variation, and as a result I have left it out. As a summary, the underwing pattern is key in separating Scopoli’s from Cory’s, with the build of the bird and the flight style acting only as backup features. At the same time, there is some variability on all of these features, and as these are rather subtle differences, good and relatively prolonged looks need to be had to accurately identify the species. It must be noted, though, that not all individuals seen as either Cory’s/Scopoli’s can be confidently identified to exact species level due to both individual variability and quality of the sighting.